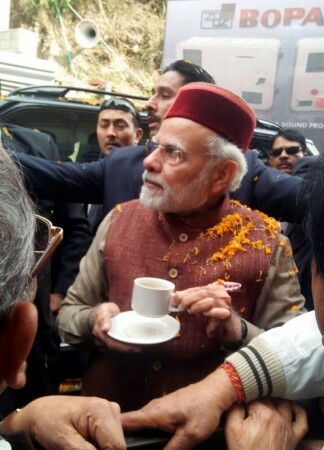 Remembering his early years spent at The Mall Road here in Himachal Pradesh and at the Indian Coffee House with his journalist friends, Prime Minister Narendra Modi on Wednesday didn't miss an opportunity to sip a cup of coffee. As he was on his way to the airstrip, Modi's cavalcade stopped outside the popular cafe Indian Coffee House on The Mall. Modi spent more than 10 minutes outside the Coffee House and enjoyed a cup of coffee where hundreds of BJP workers and others were assembled. Armed with mobiles, Modi was mobbed by fans as they tried to take selfies with him. The Prime Minister was here along with his cabinet colleagues and BJP President Amit Shah to attend the oath-taking ceremony of Jai Ram Thakur as the Chief Minister and his 11 cabinet colleagues. Shimla's famous outlet has seen many prominent customers -- late Prime Minister Indira Gandhi and former Deputy Prime Minister L.K. Advani, who was also here on Wednesday to attend the swearing in ceremony. When he studied in India, former Afghan President Hamid Karzai was a frequent visitor, too. Modi, during his earlier visit here in April, recalled that he used to spend hours at the Coffee House with his journalist friends to keep a tab on the state's political developments. Many from Shimla's academic, legal, art and journalistic circles were regular clients too. In March 2000, then Home Minister Advani spent time at the Coffee House with his party colleagues over coffee. He again visited it in August 2009 along with then Gujarat Chief Minister Modi. Modi had said at a public rally here: "Sitting at the Indian Coffee House along with my journalist friends, I used to get an insight into the state's political developments."